Convenient prepared whipped topping can be found in the frozen section of the grocery store. This can be used in place of whipped cream. 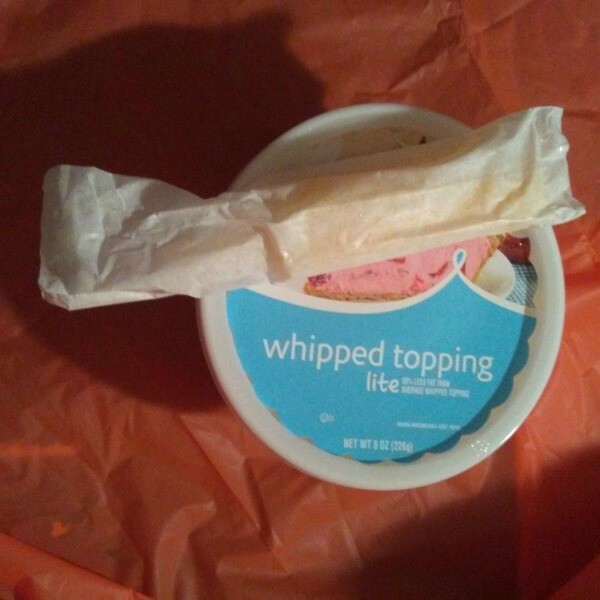 This is a guide about using frozen whipped topping. When using canned frosting mix, place the mix in a bowl and add 1/2 cup of whipped topping with it and whip with mixer for about a minute. It doubles the amount and makes it easier to spread. When preparing a recipe that calls for a thawed whipped topping and you find that yours is still in the freezer, don't put it in the microwave to thaw. 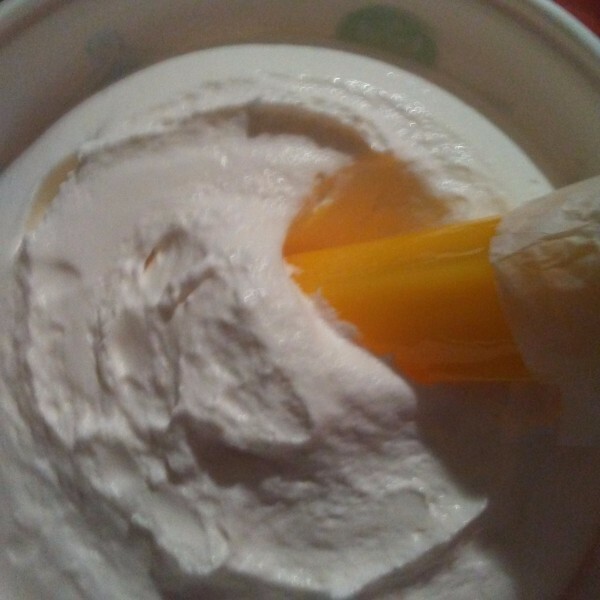 When this happens, you lose some of the quantity of your whipped topping. 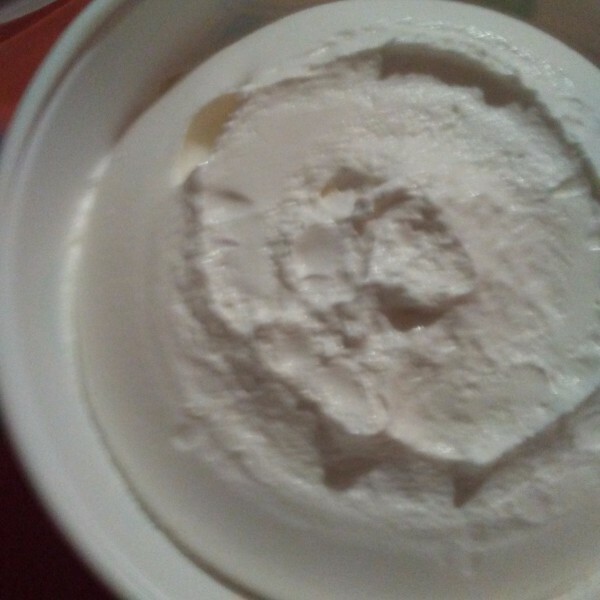 It's better to put your container of frozen whipped topping in the refrigerator the night before or several hours before you're going to prepare the dish requiring it. 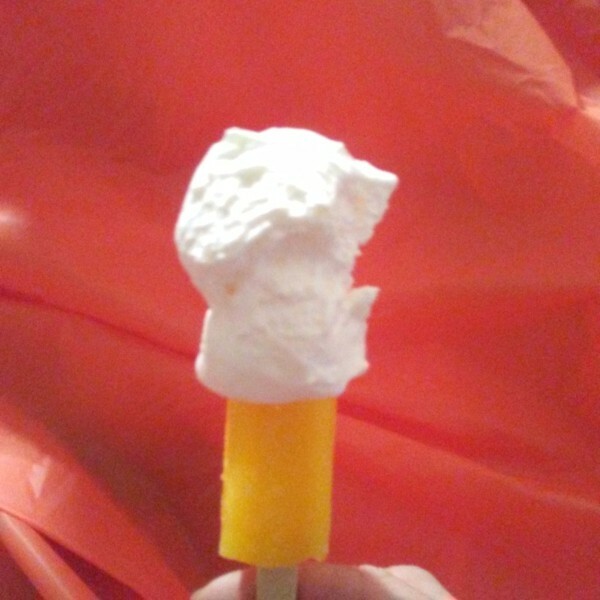 One of the best toppings for a banana Popsicle is whipped cream. You can put vanilla wafers crumbs in a bowl and sprinkle them on top. The taste is reminiscent of banana pudding and can't be beat for simplicity and fun. Question: What is Cool Whip? I would like to make a recipe, but am at a loss. What is Cool Whip please? Cool Whip is a brand of imitation whipped cream named a whipped topping by its manufacturer. It is used in North America as a dessert topping and in some no-bake pie recipes. It was generally described as "non-dairy" as it contained no cream or milk and no lactose; however, it did contain the milk derivative casein. Recently, both skim milk and light cream have been added to Original Cool Whip. You can find Cool Whip in the frozen food section at your local grocery store in the United States, but I'm not sure about other countries. If you can not find Cool Whip, you can make homemade whipped cream and substitute that for the Cool Whip. If you can't find Cool Whip try a search for stabilized whipped cream, it should hold up in recipes like Cool Whip. Cool Whip is whipped cream. It is used as a topping on desserts. You can find it in your freezers section of your supermarket. Picture of cool whip included. Had the same problem here in Europe a while ago. Packets of whipped topping or birds eye dream whip or dream topping is fine to use instead. Cool whip is not whip cream. It is fake whip cream. It comes under my list of fake food and I wouldn't touch it with a ten foot pole no matter how good it is. I do not even use margerine though. The purpose of cool whip was for food companies to use up all the by products from the processed products they were making. Then they pass them off to the public as "low cal" or "non dairy". It is kind of like non fat half 'n half. There is no such thing. I try to keep chemicals out of my kitchen. Cool Whip is a brand name for frozen ready to use whipped topping. There's a good reason you can't find it it your country. Your country is smarter and cares more about your health than the US does. Our country is run by agencies that get pay offs from large food factories that make fake food that is extremely bad for your health. Of course they make it taste good because nobody would pay for health destroying chemicals if they didn't "taste good". By the way they taste good because the food industry has trained our taste buds from a very early age. Did anyone see Jamie Oliver's Food Revolution and what is happening to children's perception of what tastes good. It was shocking. Anyway stay with what Mother Nature created. Cool Whip is a artificial whipped cream that will hold up in a recipe. It is made from hydrogenated vegetable oil (coconut and palm kernel oils), sweeteners, flavoring, and preservatives. It tastes very good. I prefer to use heavy cream, but if you are making a recipe like pie topping, etc. whip cream might not hold up. I get heavy whipped cream to hold up a little better by adding a melted marshmallow when I am whipping it. Cool Whip might not be sold in your area. We do not have 'frozen whipped topping'. Would I just use whipped cream? Thank you for any replies. Combine gelatin and cold water in a small saucepan. Let stand until thick. Place over low heat, and stir constantly until gelatin dissolves; about 3 minutes. Remove from heat, and cool slightly. Whip cream, sugar and vanilla until slightly thickened. While beating, slowly and gradually add gelatin to the whipped cream mixture. Whip at high speed until stiff. 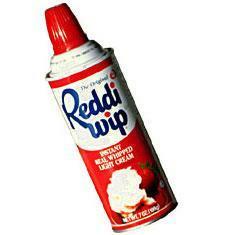 Do you have Reddi Wip (or another brand of whipped cream) in an aerosol can? It is usually in the cooler, close to juices or eggs. That could also be a substitute. Do you have Coolwhip? I think that's what they meant. You could use whipped cream, but you would have to keep it refrigerated. It holds up better if you soften a marshmallow and whip it into the cream. Good luck! 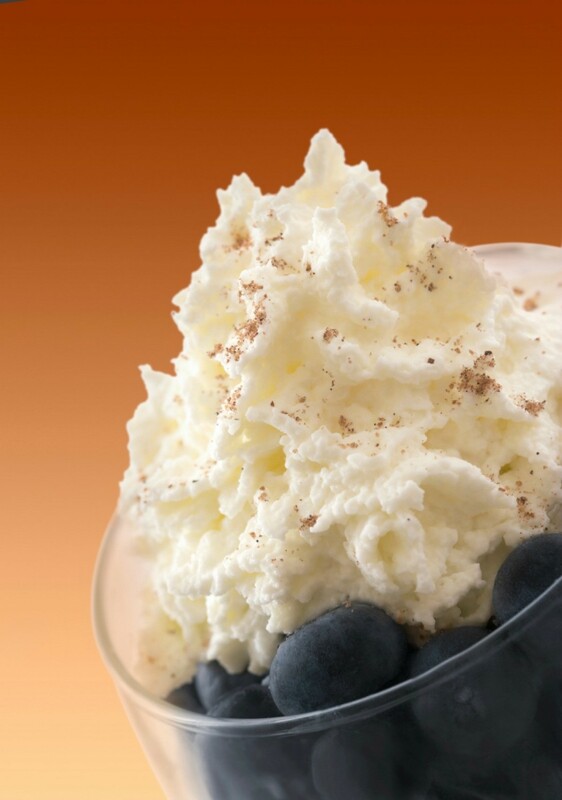 Whipped topping is the same as non-dairy whipped topping(because it doesn't contain any dairy products). Cool Whip is only one of many name brands. There are also powdered products that you add milk to and beat with a mixer(Dream Whip and Nelson are some brand names). All of these products are interchangeable. Thank you to all. What I usually do is add a tablespoon of instant vanilla pudding to 250ml cream when beating, so that it holds its shape. Just wasn't sure what this frozen whipped topping was! Many thanks for all the replies. You don't want frozen whipped topping anyway, it's got a lot of partially hydrogenated fat in it. They make that by superheating oils and blowing hydrogen through it, so it's more like a plastic, and particularly toxic. Of course there is saturated fat in whipped cream, but the trans fat stuff is worse. It has been shown to have an affinity for brain tissue and it promotes cardiovascular disease more quickly by a different pathway than sat fat. It's very synthetic stuff and once you've tasted it, you'll want real whipped cream every time. Non-dairy Creamer [coffee creamer] can be whipped into topping like dream whip. I get the large jars at Sam's club& the directions are on them. Its 2 parts creamer to 1 part cold milk: sugar &vanilla to taste. It takes 5-7 minutes of whipping at high speed until stiff. Keep on hand for when you are out of cool whip. Pretty handy, and so much cheaper than dream whip. You can also use Dream Topping (in the envelope) and prepare according to package directions. In some baking recipes Cool Whip is used. Does anybody know if it is manufactured under another name? In Ireland I have failed to find it. Hope you can help. Basically, Cool Whip is a non-dairy sweetened whipped topping. You could substitute sweetened whipped cream in some recipes; or the prepared Dream Topping. Good Luck! Thank you Jilson for information on cool whip. I live in the south of Ireland and do not have an Asda store but I can purchase Birds Dream Topping. Again thank you, now I can try some of the recipes I have saved.